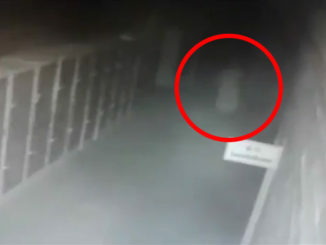 This CCTV Footage will freak you out! This scary security footage has whipped authorities into a panic. From a man who licked a doorbell for three hours to a creepy haunting of an American high school, watch these terrifying moments caught on security camera. In a follow up to our scary footage caught on Ring doorbell security cameras article we posted in December, here’s a terrifying encounter captured on film. In early January, 2019 a California man was caught licking a doorbell for nearly three hours. The footage was captured by the home security system that is activated whenever someone approaches the door. The man, later identified as Roberto Arroyo, approached the home in Salinas, California and began an intimate licking session with the doorbell from the hours of 2am to 5am. Homeowner, Sylvia Dungan, told news website KION546.com that she wasn’t at home at the time of the encounter but that her children were. The Ring home security system notified Dungan of movement at her home which she thought was odd as her son, who works nights, doesn’t normally arrive home until 6am. The bizarre video was posted to social media in a bid to warn the community and to hopefully identify the man in the video. Police quickly determined that the man was Roberto Arroyo, who is also accused of stealing extension cords that were powering Christmas decorations back in December. Arroyo faces charges of theft, prowling and violation of probation. 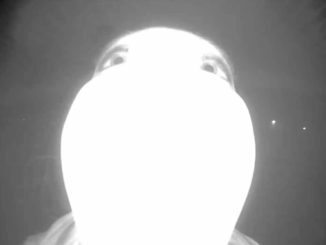 This is some creepy footage captured by a home security system in 2013. In the video you can see a woman stumble out of the darkness. She wanders aimlessly around the property for more than 20 minutes. It’s almost as if she’s looking for something but keeps forgetting where she is. At one point, at the 41 second mark, she walks passed the camera clutching at her arm as if injured. The poster claims that the footage was captured on a cold, wet night on a property in the mountains far from any main road or neighbors. If the woman was injured or lost then why didn’t she ask the homeowners for help? Sadly, without more information, we may never know. This is a weird little piece of security footage that shows maybe Bambi isn’t so friendly after all. In 2017, at an unknown location, a security camera caught the wild moment a deer ran down a man. In the footage you can see a blue vehicle drop off a male with a backpack. Suddenly from the right of screen a deer, running at top speed, collides with the man. The victim is flattened to the ground as the deer continues out of shot. It’s not known whether the man was injured or not, however the encounter is sure to have given him a fright. 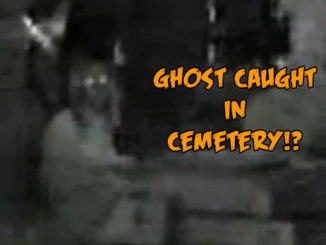 Scary security footage has been captured at, what is allegedly, one of America’s most haunted schools. In 2014, the security system installed at Pocatello High School, Idaho captured what many are calling a poltergeist haunting. In the footage you can see an eerie display as lights across the school flicker on and off sporadically. No less than nine separate cameras capture the bizarre event. Finally, camera B6 in the upper hall captures what appears to be a grey entity leaving a doorway. It’s a wispy, translucent figure that floats down the hall. The footage was captured during school holidays which means, apart from a possible cleaner, no one was at the school at the time of the incident. It was reported that the event was so disturbing that the alarms were triggered and police responded. Former principal, Don Cotent, weighed in on the paranormal incident. 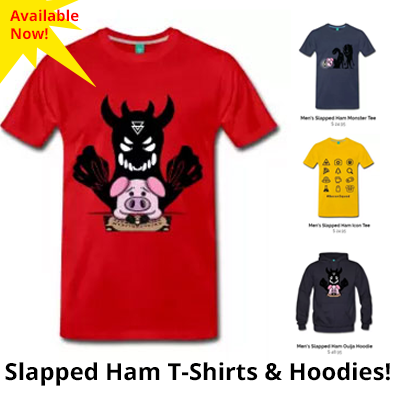 He said that he recalls up to four occasions where an inexplicable banging sound could be heard beneath his office while working late at night. As news of the haunting spread, teachers and staff also gave their chilling accounts of strange happenings around the school. Some have reported eerie piano music after hours, a ‘ghost man’ in the gym rafters and a shadow figure in the auditorium. In response, the school hired a paranormal investigation team who were stunned at the footage. They believe the incident may be related to the six deaths that have occurred on school grounds or the devastating 1914 fire that destroyed the original building. What do you make of this creepy piece of security footage? Could it somehow have been staged or is it genuine evidence of a ghostly haunting? 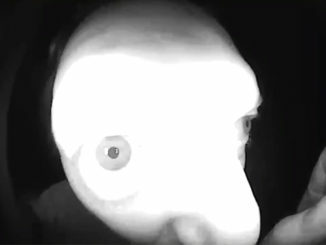 This terrifying piece of footage was captured by a Ring doorbell home security system. In September 2017, a scary piece of security footage began doing the social media rounds. The black-and-white footage shows a clown holding several balloons standing ominously outside this home in Green Bay, Wisconsin. The clown walks up to the door of the house and just stares creepily into the camera. At the time, police were worried that the footage, coupled with release of Stephen King’s It in cinemas would spark another spate of copycat clown sightings. In 2016, the so-called ‘clown epidemic’ hit fever pitch when creepy clown sightings were reported all around the world. People dressed as evil clowns were spotted in settings like forests and schools sparking fears of criminal intent. The incidents were first reported in the US and Canada but quickly spread to other parts of the world such as the UK and Australia. When the clip was uploaded to Facebook it spearheaded a debate. While this footage is terrifying, some viewers believe that the incident is a setup designed to gain publicity. Others said that they were going to buy a home security system regardless of whether the footage was a hoax or not, stating that you can’t be too careful when it comes to things like this. So what do you think? Was this footage staged? Or is there an unhinged member of the community walking around as a clown looking to scare local residents? Viewers think this old piece of security footage is proof of a doppelganger. In 2010, a security camera at an unknown dance school captured some startling footage. The dancer is practicing a routine, honing her technique in the reflection of the wall-to-wall mirrors. After several minutes the dancer sits on the floor for a rest. Then in the mirror to the left, the reflection eerily turns her head despite the dancer remaining still. The reflection turns and stands up ominously. It’s at this point the dancer realizes what’s happening and makes a hasty run for the door. This clip was shared to Facebook in April, 2018. It immediately went viral racking up 4.5 million views in just a few weeks. Commenters called the menacing figure a ghost or doppelganger. In German mythology doppelgangers are twin lookalikes seen as a ghostly phenomenon – often thought to bring about misfortune. Could this girl really be haunted by a doppelganger? Or is there some other supernatural power at play here? This eerie piece of footage was uploaded to Youtube channel ‘Paranormal Asso‘. Taken in 2013 at an unknown location, this motion activated camera was turned on when movement was detected in a storage room. In the footage, the lights turn on and the alarm system triggers. After several minutes the lights turn off and the camera switches to infrared. The description at the beginning of the video alleges that, at one point, this building was used as a mortuary and this room was the ‘cooler’. 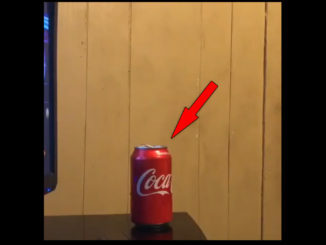 The first recorded piece of unexplained movement comes when a box falls off the top shelf. Moments later, several brooms fall to the ground. Then a shirt hanging on the wall begins to blow about as if a gush of wind has swept through the storage locker. It happens once more, this time blowing the shirt right off the hanger, as a piece of wood also falls to the ground. Finally, the camera seems to glitch and cut out. The poster claims that the police arrived some 30 minutes later to find that the entire storage unit had been badly vandalized. 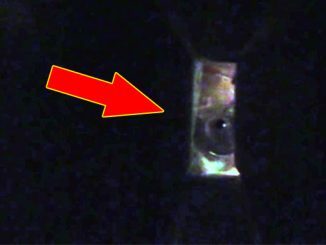 While these sorts of paranormal videos can easily be staged with a few bits of string and people hiding off camera, it’s still an eerie piece of footage. Many viewers are genuine believers that this is a poltergeist causing havoc. What do you think? String, poltergeist or something other phenomenon. Let us know your thoughts in the comments below. This security camera footage began surfacing in August, 2016. It shows a man getting into a taxi, but what the camera captures will give you chills. As the man approaches the cab, an eerie ghost-like figure materialises out of thin air. It follows the man as he gets into the cab. The figure looks to be wearing a long, white dress with flowing black hair. It has hunched shoulders almost moves with a gliding motion. Weirdly, the taxi door also seems to open by itself but, admittedly, this might be a feature of the car. Almost immediately, the footage went viral getting picked up by several large news outlets, garnering thousands of views. 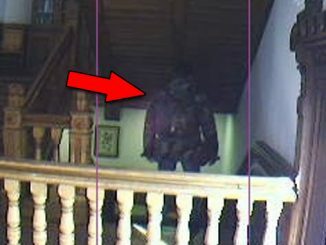 Many called the figure a ghost while others thought it was nothing more than a glitch in the footage. The video came at a time when dozens of taxi drivers in Japan were reporting ghostly fares that would mysteriously disappear during the ride. A study, conducted by Tohoku Gakuin University, found that taxi drivers in Ishinomaki, one of the areas most affected by the 2011 tsunami, were making the most reports regarding these mysterious passengers. When he turned around, there was no one in the back seat. This is some eerie footage of an alleged killer moments before a murder. In the early hours of April 18, 2016, 45-year-old fitness instructor Terri ‘Missy’ Bevers was murdered in the Creekside Church in Midlothian, Texas. She was setting up for a group fitness boot camp that was due to start at 5 AM. When students began to arrive for class they discovered Bevers’ lifeless body lying on the floor. She had died from puncture wounds to her head and chest. This footage, which was captured by the church surveillance cameras, shows the suspect moments before the murder. The unidentified assailant, who is wearing what appears to be police tactical gear, walks nonchalantly down the hallway. They have a peculiar gait as they wander back and forth opening doors. When the footage was released to the public, internet sleuths began deciphering clues to the case. Youtube channel, Taavi I, compared the unusual walking style of the alleged murderer with Randy Bevers, Missy’s father-in-law. When compared the demeanour of the two people is uncanny – but no definite conclusions can be drawn. Years later the case is still unsolved. Despite an exhaustive investigation, police have been unable to identify the person in the footage. So there’s our look at some scary security footage that has been captured over the years. Which one of these do you think was the creepiest? Let us know on any of our socials or in the comments below. 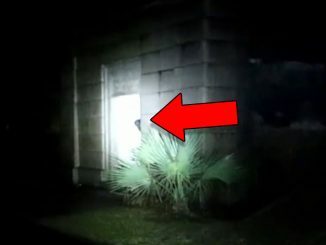 Real Ghost Footage You Have to See!